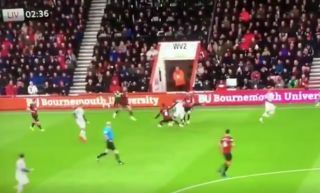 Naby Keita took showboating to the next level today, as the Liverpool midfielder single handedly ended the careers of two Bournemouth players with an inside double nutmeg run against the Cherries this afternoon. The Mali international, who was chosen to start the game by Jurgen Klopp, nutmegged a pair of Bournemouth stars within seconds of each other in the Reds’ clash against Eddie Howe’s side this afternoon. We knew Keita was good from his time with RB Leipzig, but we didn’t realise he had this in his locker! Here’s a clip of Keita’s crazy skill against the Cherries this afternoon. Close your legs, lads!